Have you ever just lay down to go to sleep for the night…but…you can not sleep because you have an annoying cough? Or you are in the middle of work or at a restaurant, and just have a coughing attack in public? It is so embarrassing! 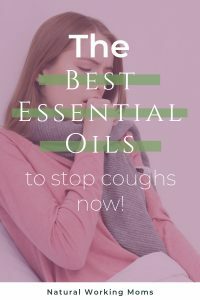 This is why you need to read on, to find out the best essential oils for cough. Did you know that after you are sick, the cough can linger on for weeks. So even if you have been done with the sickness for a long time. You can still be coughing. Or maybe your kiddos are still coughing even though they went back to school a couple weeks ago. I’m sure no one (teachers and kids) are not excited to have kiddos still coughing all over the place. So I am going to talk about what essential oils to use for a cough, so maybe we can make that cough last a shorter amount of time. This oil is a must have all through a respiratory sickness, allergies or a cold. Lemon is awesome for thinning the mucus you have going on from being sick or from allergies. And it is amazing for helping with a nagging cough. I apply directly on the outside of my throat. Or, if the cough is really bad, I will also put a couple drops in water and drink that. Then the oil is getting directly to your throat. This just stops the cough right in its tracks. Here you can read about other uses for lemon essential oil! Lime essential oil is kind of in the same group as lemon. But sometimes it seems to work better than lemon to get rid of a nasty cough. You can use it in the same way. Put it on the outside of your throat, or put a couple drops in your water and drink it. Personally I think lime tastes better than lemon in the water. So if the lemon isn’t working, then reach for the lime. There is also a recipe down below that has lime in it. So it can be used by itself, but sometimes it can be added to other essential oils to create a real powerhouse to stop the cough. This oil I just discovered the last time I was sick. It is a new oil in my oil company, and it was one that not many people know about. But, let me tell you, it helped clear up my cough right away. I just put a couple drops in my hand, and then rubbed on my chest. If you are a little more sensitive to oils, or want to put on your kiddo, then please dilute. My son and I were sick around the same time and this oil helped both of us. This one comes as a surprise to some people. Especially people that know their essential oils pretty well. Because marjoram is usually used for things like sleep and pain. But, it can also one of the best essential oils for cough. This is the first go-to my sister in law uses as soon as her kids have a cough. She puts it right on their chest, and in a few minutes, they are not coughing anymore. We also like to combine it with other oils for a really bad cough, so keep reading! I don’t know if you guys have ever heard of this but honey is really good for a cough and for soothing the throat. My favorite recipe to use is to put a teaspoon of honey onto a spoon. Then add one drop each of lemon, wild orange, frankincense and peppermint. Then swallow it all down, honey and all. It doesn’t taste the best (the frankincense tastes especially bad), but if you are desperate to get rid of a cough, then this is the recipe for you. I wouldn’t use this in kiddos under about age 6 just because they don’t understand that, even though it tastes bad, it will help them with their cough. Also you can do this a couple times a day to get rid of the cough. I wouldn’t do anymore than that because then you are getting a lot of honey. If your kiddo is under 6 or you don’t like honey, then you can put these four oils on the bottoms of your feet, or you can use the next recipe that I have to share. The cough bland my sister in law uses on her kiddos that are under 6 is marjoram (like mentioned above), lime and eucalyptus. All of these oils are good on their own for cough so if you just have one or two of them, then definitely give that a try. But when you put them together, that could is stopped in its tracks. What she does is put about 6 drops of each of these oils in a rollerball bottle and fill it up with coconut oil. Then she labels it her cough blend. This way she has to on hand ready to go when her kiddos have a cough. She rolls on their chest, their back and on their throat. And she does this multiple times a day to keep that cough away. I just bring this up because there are cough medicines out there to use. But they do not really work that well. Plus, some of them, can cause a lot of drowsiness. So on top of having a bad cough that lasts for weeks, now you have drowsiness. I can not have my boys back at school after being sick, and being all drowsy. 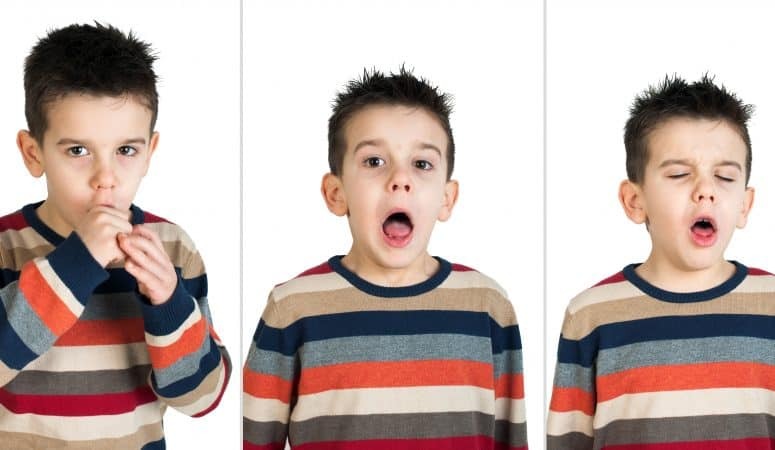 This is why I always reach for the essential oils when I have a cough or one of the boys has a cough. Here are other oils to use if you have more than a cough! And these are the best essential oils I have found to stop that nagging cough. Try them out and let me know which oil works best for you.